Supported Applications, All Open Source Applications, Third Party Applications or All Available Applications. Then add a check to the check box of the application you want to install, click Apply Changes and then Apply and type you password and click Close. FontForge (formerly PfaEdit) allows you to edit outline and bitmap fonts. You can create new ones or modify old ones. It is also a font format converter and can convert among PostScript (ASCII & binary Type 1, some Type 3s, some Type 0s), TrueType, and OpenType (Type2), CID-keyed, SVG, CFF and multiple-master fonts. This package also provides these programs and utilities: fontimage – produce a font thumbnail image; mensis – examine and modify some of the tables in a truetype or opentype font; sfddiff – compare two font files; showttf – decompose a font file into its various tables and display it. This application is provided by the Ubuntu community. 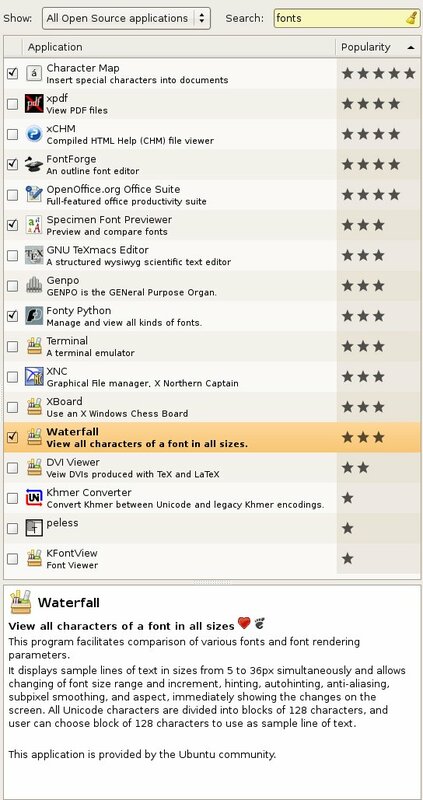 FontyPython is a GUI tool to manage ttf fonts on GNU/Linux system. It is written in Python and WxWidgets. You can collect any fonts together (even ones not in your system font folders) into ‘pogs’ and then install and remove the pogs as you need them. In this way you can control what fonts are in your user font folder – thus avoiding long lists of fonts in the font chooser dialogues of your application.